"Don't be dismayed at goodbyes. A farewell is necessary before you can meet again. And meeting again, after moments or lifetime, is certain for those who are friends." Being one of the survivors in the company means that I have to experience a lot of farewell parties, which I hate. Although I've trained to see people come and go, somehow it's just painful. Especially when I have to extend the goodbye parts to my close ones. To the familiar faces that I see about 8 to 10 hours/day times five days in a week. Those whom I practically see more often than I see my people at home everyday. Today is Sherry's last day. No one expected this, but it has come. 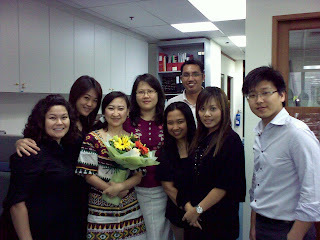 I took the whole department to Marquee Restaurant at Far East Square and we threw Sherry a farewell lunch. We talked about the politics in the office, her feelings, her plans, etc. Sherry said she is going home to China next Friday for a month as she has not been home for two years. She wants to relax and forget everything here. Kudos for her! She said her hometown is in Hei-Long Jiang. Never heard? Me neither. Apparently, Hei-Long Jiang is a province in the northeastern part of China. It is located way up there and near to Russia. Best part is, it's darn freezing almost for the whole year. People have to wear a lot of layers of clothes all year round. Brrr, not my thing at all. Sherry has been part of the production team for about 11 months now. She was always so nice and helpful to us. I often asked her to help me translate and make phone calls to China and Japan when I had to face hopeless Chinese and Japanese secretaries. 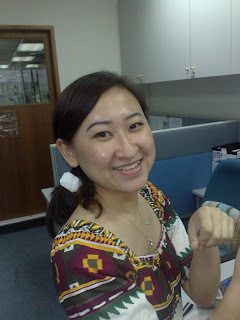 She was the supplier of sweets, Japanese snacks and coffee powder to the whole department. We will miss you, Sherry! We gave her a self-made farewell card and a flower bouquet. As pretty as she is. And she deserved it more than anyone. A box of Kleenex Tissue that she bought after the CNY, to everyone. Some cute miniatures she bought in 7/11 a while ago, to me. Happy trails to you, Sherry. As I've mentioned many times, there is a much better place than this one waiting for you out there. It was my pleasure to know you and I indeed enjoyed our friendship. All the best for you and until we meet again!